Hard aspects to the Nodes in synastry get a lot of attention. Conjunctions and squares from one person’s planets to the other’s Nodes indicate a past life connection that is compelling enough to create tension in this life. The tension creates magnetism that draws people together, for better or worse. But what about the easy aspects? Trines and sextiles to the Nodes also mean something, even though they don’t grab people like the hard aspects. Any synastric aspect between planets and Nodes indicates a past life relationship. Details about that relationship are described by the nature of the planet, aspect, signs and houses. There is a difference between a trine and a sextile, even though they are both harmonious. From an evolutionary perspective, the sextile is an opportunity for the Node person to progress from their South Node comfort zone (ingrained from their past life) to their future (the North Node). They can learn about the contrast between what was and what could be. The trine represents a complete understanding of their North Node path, and easy integration of their South Node lessons. The sextile is growing awareness, and the trine is lesson learned. The planet person is the trigger. Any planet that trines the North Node will sextile the South Node, and vice versa. Kelly’s Mars sextiles Chris’ South Node, and trines his North Node. Her actions (Mars) feel familiar and comfortable to Chris. In their past life, they worked or fought together. Since she’s the Mars person, she may have been the one who urged him along when he got tired, discouraged or wounded. In this life, the way she asserts herself/gets things done is a prompt for Chris to move towards his North Node (which her Mars trines). There is a feeling of camaraderie, and she supports his explorations. Maybe she’s already mastered the situation his North Node describes, and all he has to do is follow her lead. If her Mars trines his South Node and sextiles his North Node, the comfortable vibe between them would be even more pronounced. In their past life, there may have been a specific task they worked on together. Perhaps they achieved something (built a cathedral, won a particular battle) and Kelly was in charge. In this life, there’s a sense of accomplishment that’s already happened, and the area described by Chris’ South Node is where they continue to do good work. But her Mars also sextiles his North Node, so Kelly can still nudge him forward, encouraging him to try new (North Node) things. But here’s the tricky part: these aspects don’t create much impetus for change. If there are no other aspects between their Nodes, and the rest of their synastry is fairly placid, it’s possible that there’s no unfinished business between Kelly and Chris. In their past life, they got along with each other and accomplished their tasks together. End of story. In this life, the aspects from Kelly’s Mars are a hint that Chris could take, but the lack of tension could also enable Chris to stay exactly where he is (in his South Node rut). Or, maybe Kelly’s the one who encourages him to stay where he is (more likely if her Mars trines his South Node). Why should he change when things are going so well between them? Much depends on the rest of their charts. By themselves, sextiles and trines to the Nodes do not indicate powerful attraction. Kelly and Chris could be platonic co-workers or lovers. If other aspects between their charts indicate chemistry, or there are hard aspects to the Nodes (in addition to the trine/sextile), the easy aspects will certainly add information. Again, they can enable evolution or stagnation for the Node person. Without awareness on the parts of both people, it can be easy to overlook these little aspects, and waste the opportunity they present. What Happens When You Meet Your Skipped Step? I was just wondering – do inconjunct and semisextile aspects to the nodes count as hard aspects, or is it only the conjunction and the square? Also, how do the signs and houses work when you are trying to figure out what it all means? Thank you. inconjuncts count as hard aspects. I don’t consider semisextiles strong enough to have much of an impact. If you type the word “Nodes” into the search field on this site, you’ll find articles on house overlays, the importance of signs (and their rulers), etc. With synastry contacts to the nodes are we looking at only personal planets or all a person’s key planets? 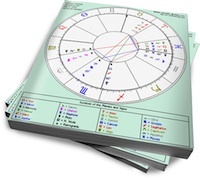 All planets, although personal planets indicate a more personal relationship (in the past life) and Uranus or Neptune tend to indicate a less personal relationship (they were part of the same group in a past life but didn’t have an intense, one on one connection). The exceptions to this are if these planets have relationship significance (rule the AC/DC, aspects either partner’s personal planets, etc). Thanks for talking about this. You’re right that these do get overlooked. I love looking at these things and considering how past-life connections might have played out. It’s fun to try putting all of the pieces together. I met someone a few years ago whose Neptune trined my NN (and also squared my Moon, so there was a personal connection involved). Perhaps we were part of the same group of artists or musicians, and he personally encouraged me to express my emotions more. What’s interesting is that I remember a conversation we had in which I was telling him about a feeling of inexplicable dread I was having, and he encouraged me, rather than wallowing in it, to try to do something creative with it. It sounds pretty apt given the situation described by our Node connection. Now, it wasn’t particularly central to our relationship (we had other, more “urgent” synastry aspects), but it was nice. I got to see his more compassionate, creative side, which he didn’t reveal all that easily. I believe each planets as well as house have separate stories. Even with same person. I see it clearly with my ex and my children that past life and next life is symbolic as both here happening in one’s life. Especially in my ex’s case. But with my children there will be lessons to be learned perhaps after l’m passed away. I enjoyed reading your example of Mars and Node as l have my node conjunction my daughter’s Mars and my Son NN conjunction my Mars even your example was about trine/sextile it made sense. It’s very interesting when you can actually experience the aspect with close people and loved ones. My daughter and my ex pushs/ed out of my comfort zone, l push my son out of his comfort zone. you’re welcome, and thanks for the example! Hello Basic would you tell me how trines and quintiles would be felt to points like the Mc trine NN and quintile ASC? Given the nature if the 12th house can he feel this energy? And How does it affect me? How interpretationvis given between 2 people who are really close with NO aspects to nodes in synastry… This is actually not that common, but is a true story. No minor or major aspects whatsoever. Thoughts? What interpretation is given between 2 people who are really close with NO aspects to nodes in synastry… This is actually not that common, but is a true story. No minor or major aspects whatsoever. Thoughts? I’ve several planets aspecting his Nodes (which I think it’s enough to make an impact even though they’re mostly the easy trines/sextiles) – my Venus trine his NN, my Moon/Neptune sextile his NN and my Saturn square his Nodes. How should I interpret these as a combined impact? Hi, I have a question. What if North Node trines another North Node? Thanks.